Ektoplazm is 100% supported by the community; please donate! 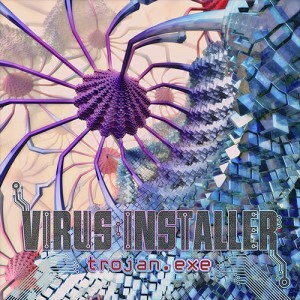 Australian producer Virus Installer is proud to present his debut release, Trojan.exe. Bridging the gap between full-on and morning psytrance, this album is jam-packed with dazzling, mind-twisting melodies and addictive bass lines. The aim was to capture the essence of super fun psytrance, kicking up dust at the best party you’ve ever been to. Every track on this album is designed to have the listener on tenterhooks, reaching the end and turning right back around to go back for more. Mastering by Rory Robinson at Satori Studios. Artwork by Beau Deeley (Xenodimensional). MP3 Download | FLAC Download | WAV Download · Download count: 15,688. Released under a Creative Commons license for noncommercial usage. This will inspire some fresh shapes on the D-Floor for sure! Very happy to see this release it in the wild. Very nice music and I’m sure there will be much more to come. Was a pleasure to master. Great sound, well worth the download. Increible, me gustó muchisimo, bien arriba y con sutilezas. Very much appreciated & truly hope you enjoy the music. I’ve already started writing for the next release! muy bueno, es como la cuarta vez que lo escucho y siempre le encuentro sutilezas y ritmos atractivos. Desde THE READER para adelante se vuelve un viaje muy psicodélico, me encanta tu mambo a la hora de crear sentido viajero. avisa cuando tengas el 2do album! I will say that there a couple moments where there’s not quite enough different sounds going on, or where flaws in the production stick out a little, like a popping noise in one of the breakdowns of “Sonar”. Killah! Master peace. Grande, brother! Wow! It had been a very long time since I have listened to anything like this. Calling the whole album a masterpiece falls very short. Way to go, mate! Looking forward to listening to your next one, hopefully very soon. ©2001-2019 Ektoplazm | Facebook | Twitter | About Us | Help | Distribution | Donate!